With its cluster of information dating from 1300 AD onwards, this chart illustrates the remarkable agreement among the different types of evidence for people first settling in New Zealand around that period. Ash-fall dates from volcanic eruptions are shown on the left. On the right are radiocarbon dates obtained from archaeological sites and from rat-nibbled shells and seeds. The far right shows changes in abundance of different types of pollen – indicating forest clearance. Some radiocarbon dates for the bones of the Pacific rat (kiore) stand out, as they give much earlier ages (at the bottom of the chart). Either these dates are for some reason earlier than the true age of the bones, or a canoe carried the rat to New Zealand around 50–150 AD – over 1,000 years before the accepted date of settlement. If so, this was probably a transient contact by people from New Caledonia, Fiji or West Polynesia, and the canoe’s occupants did not settle. 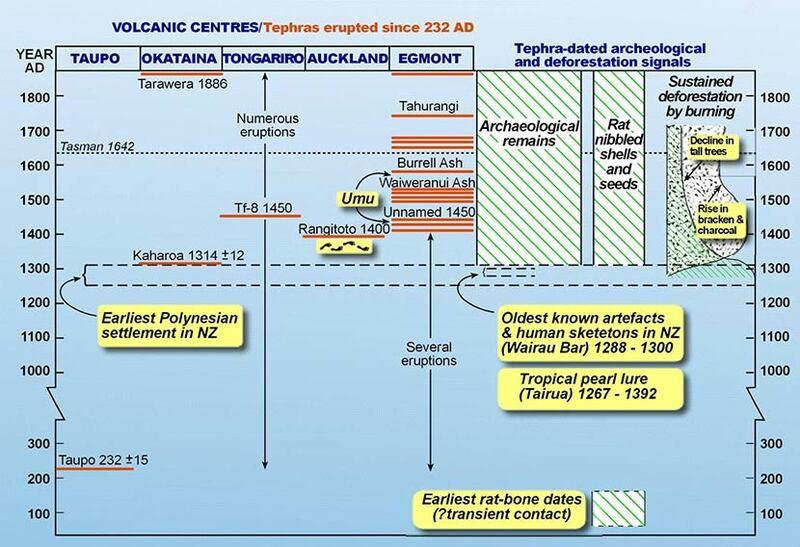 Reference: Lowe, D. J. and R. M. Newnham, ‘Role of tephra in dating Polynesian settlement and impact, New Zealand.’ PAGES (Past Global Changes) News 12, no. 3 (2004): 5–7. Thank you for your comment. As the story suggests there is no documented scientifically verified evidence that any human beings were present in New Zealand before 1250-1300. There have been many suggestions of earlier habitation; but nothing that has been reliably established. Māori mated with early Europeans from the time of Cook's arrival onwards, so there was ample opportunity for non-Māori features to be present among the Māori population from at least 1800. I have always believed that white skinned, fair or red haired people lived here long before the Maori arrived. I have seen documented evidence showing the history. The Maori came from Polynesia according to their traditions. Their earliest ancestors would have met with and probably mated with these early white folks. Is that why every now and then one can see a Maori child born with bright red hair????? And surely if this evidence is not put out there for public debate, are we not disenfranchising the Maori again? Their oldest histories, dances religions, beliefs, carvings etc must all stem from this early meeting. Why is this not common knowledge please?